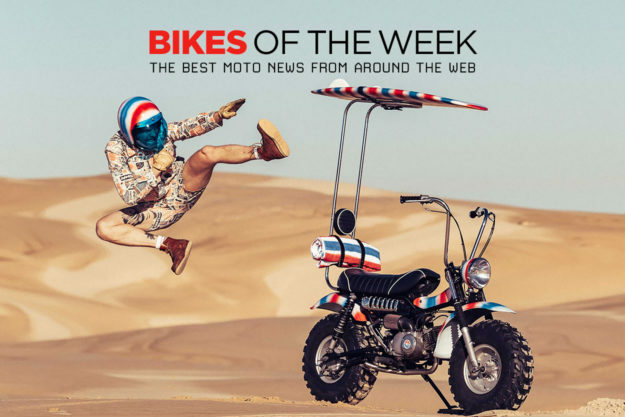 We’ve lined them up from biggest to smallest this week—starting with a slick Triumph Bonneville kit, and finishing off with the cutest electric cafe racer. With a Yamaha dirt bike, a Grom and a Suzuki SV 90 wedged in between, it’s a weird week for sure. 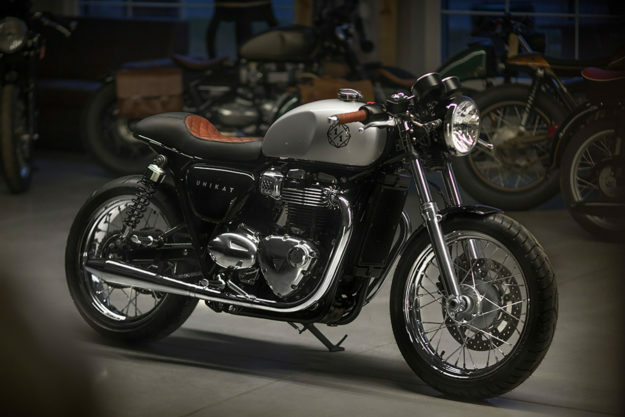 Triumph Bonneville Kit by Unikat If the impeccable fit and finish of Triumph’s Factory Customs raised your brows—but the prices slammed them back into an expression of disgust—we may have a solution. 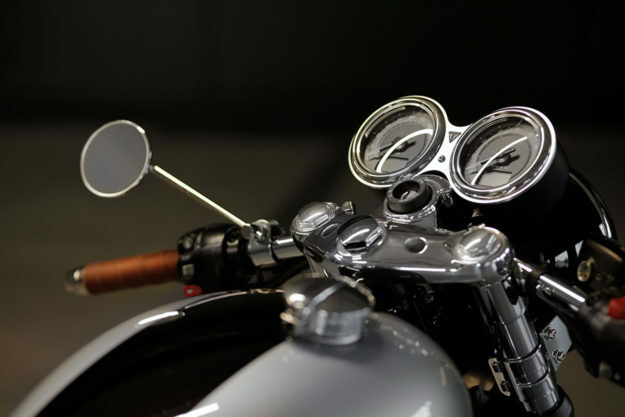 Wrocław, Poland based Unikat Motorworks have developed a bolt-on cafe racer kit for both the T100 and T120 Bonnies. And it’s damn sweet. 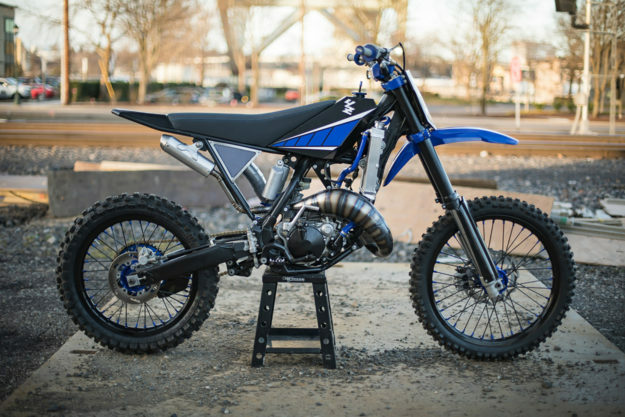 Yamaha YZ125 by Max Miille Hillsboro, Oregon, sits just over 30 miles outside of Tillamook State Forest, which is home to some of the PNW’s most incredible dual and single track off-road trails. 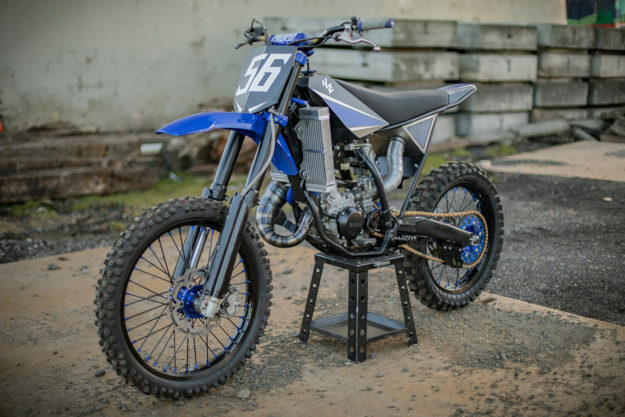 So it’s not surprising that Max Miille has a bit of a thing for dirt bikes—as is evident by this YZ125. Working from a $ 500 donor he liberated from a friend, Max decided early on that his ‘Blue Duck’ would put his fabrication skills to the test. The idea was to build a full-blown custom that could handle all of the abuse he wanted to throw at it. Max’s dad lent a hand on fabricating new wheel spacers, and New Church Moto stitched up that seat—but outside of that, Max handled the bulk of the work. The stock subframe was chopped and a sleek new tail was welded up. From there Max turned his attention to aluminum shaping—bending and welding up the Yammi’s new tank, side covers and number plate. That custom pipe was Max’s work too, and the anodized finish fits perfectly with the traditional color scheme. 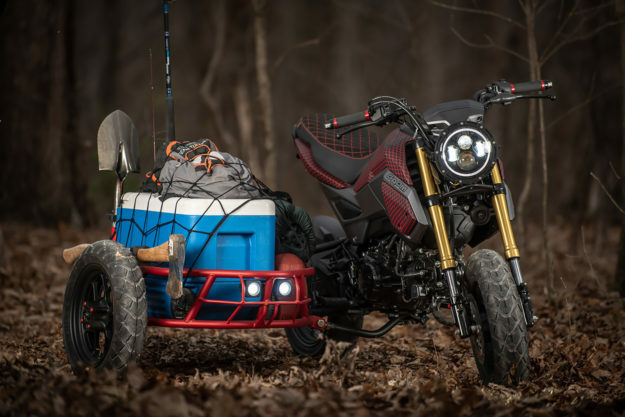 Project GUS Grom by Industrial Moto Few things in this world go together as naturally as a smiling face and a Honda Grom. 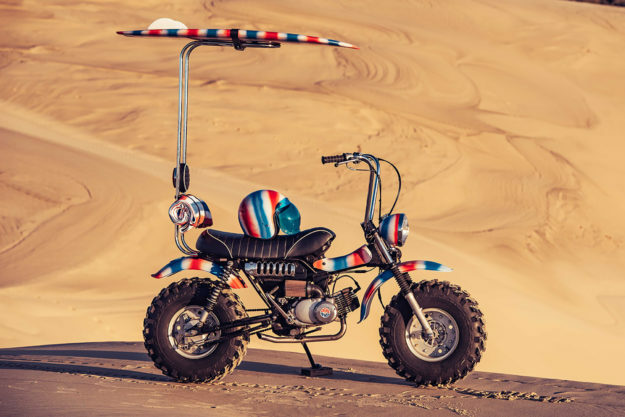 You could have just been fired and figured out the Easter Bunny is bunk—but lay eyes on one of Honda’s diminutive fun machines, and I’d bet your lips would curl. And if you spotted this one, even the Cheshire Cat would be jealous of your grin. 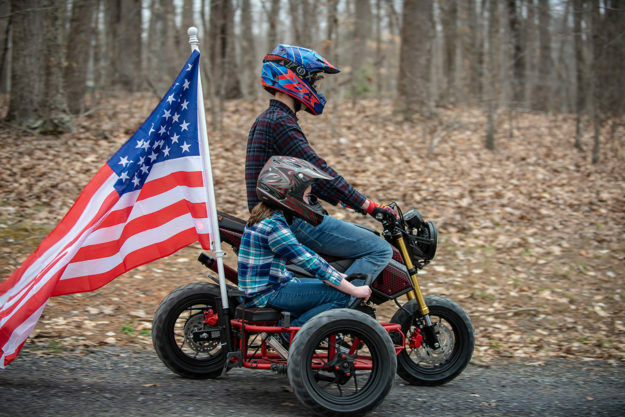 Project GUS (‘Grom Utility Sidecar’) is the genius work of Tyler Haynes, from Virginia’s Industrial Moto. Sold as a kit, the GUS features a removable side-hack that runs on its own matching wheel, mounted to independent suspension that can be adjusted for toe-in/out. Fitting it means losing the passenger pegs, and the version here also has modded plastics, bar-end LED signals and a custom exhaust. Depending on what or who you’d like to parade around town (or the pits), your GUS can be setup with a seat and grab-bar, LED lights, a rear cargo rack, or any combination of the above. The Goof Bike If a three-wheeled Grom doesn’t tickle your fancy, maybe this beach bound Suzuki RV 90 will do the trick? 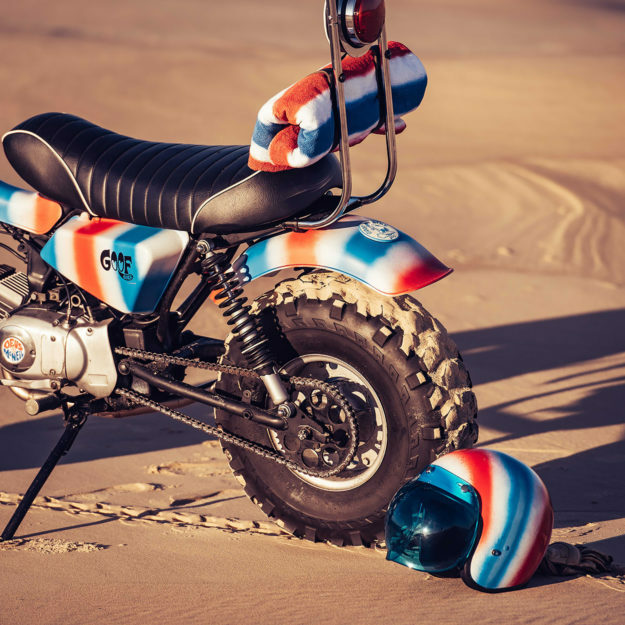 It’s the result of a collaboration between Aussie alternative artist Paul McNeil, and House of Deus denizen, Jeremy Tagand. Little was changed on the mechanical side of things, save for the new straight-pipe exhaust—fitted to scare off any kooks, no doubt. And since it’s a monkey bike, ape hangers and a chunky seat were a must, for both comfort and style. 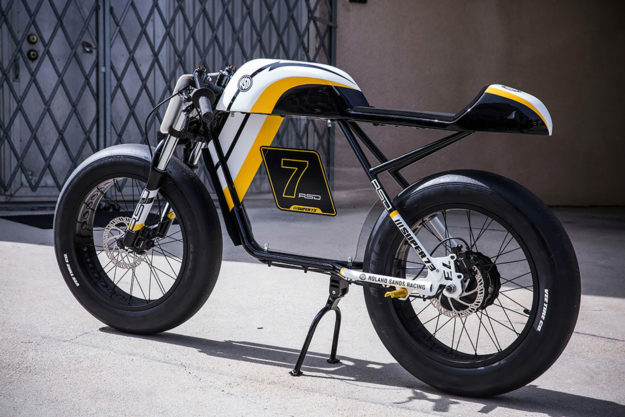 Super73 Racer by Roland Sands Paul D’Orleans recently presented his curation of battery powered pro-builds at the Petersen Automotive Museum, and the sheer caliber of bikes was mesmerizing. There’s little doubt in our minds that a two-wheeled Electric Revolution is in the works. And that could very well be a good thing—especially if it gets more riders on bikes. 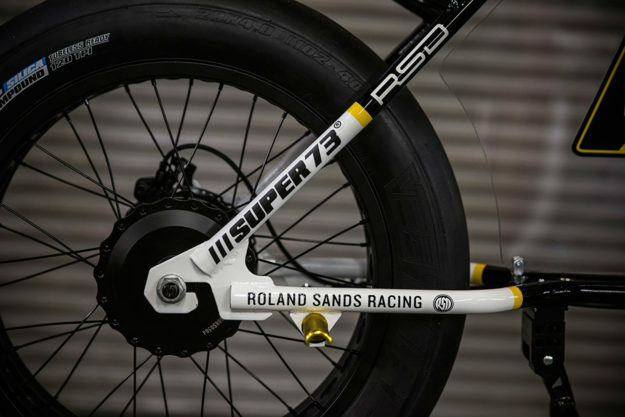 Looking to help that cause is Roland Sands and his SoCal-based RSD team. Working with Super73—a pedal-assist e-bike maker—they built a stylish, all electric cafe that any one of us at BE HQ would welcome into our fold. 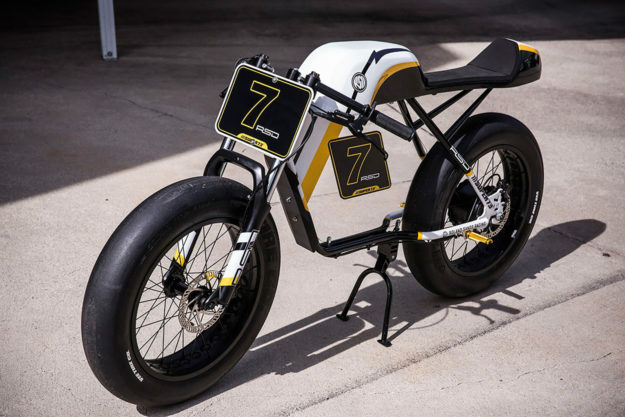 Using their Pikes Peak project as inspiration (yes, really), the Super73 Racer has a monocoque design for the tank and tail. The pedals were ditched in favour of rear-sets (the Super73 can run with a throttle), the rigid forks were swapped for actual suspension, and the high bars were replaced by low slung clip-ons.